Methylene Chloride, which we bring to you stands out of all others on counts of purity, formulation and shelf life. Plus, it is highly effective and its general chemical formula is CH2Cl2.Colorless volatile fluid with a sweet aroma, it is widely used as a solvent. Most of all, it is less hazardous and miscible with most other organic solvents. 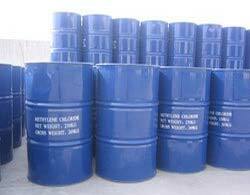 We are a top-notch Manufacturer, Exporter and Supplier of Methylene Chloride from Delhi, India.